Part 6: Off to school! Well today we had our first training session with a proper trainer. In the end I went to see Sam Thatcher near Gloucester / Cheltenham. I met Sam's partner through helping out at a working test and recently learned that she had done very well in the cocker champs. I queried with her partner if she gave lessons and thought I would go up and see if I could pick up some good advice. 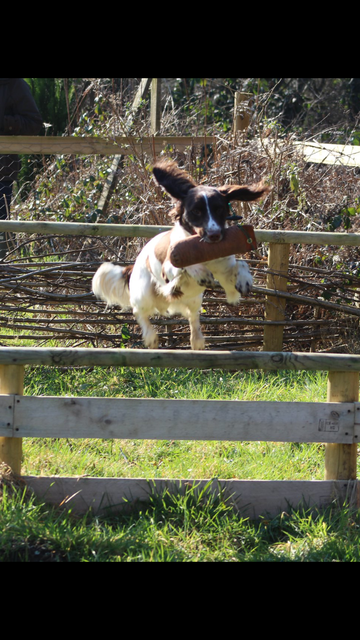 I was pleasantly surprised to learn that like myself Sam keeps her dogs in her house and not out in kennels, and she also trials (very successfully) which is something I would like to try if I can make it that far. I liked this as many "serious trainers" told me if you want the dog to be very good they need to be in the kennel , so it was refreshing to hear off Sam that this isn't the be all and end all of it. Overall I was there about an hour and a half ish, we did some hunting of cover in some tall white grass, Ted did great on this and worked really well with some rabbit scent on the ground. Having the right ground with scent really makes a big difference. Sam and I talked non-stop and I picked up some really good stuff, especially when Ted ignored the turn whistle and different ways to put it right. Ted is quite a soft dog in some ways so I think he wouldn't suit a heavy hand and isn't even 9 months yet, I found Sam really helpful and had a similar approach to myself not wanting to come crashing down on the dog. (I've seen other "Pro Trainer's" on youtube complaining that modern spaniels are too soft and can't take their corrections 😯) so I was very happy to see she had a similar approach to myself, more about setting the dog up to win and she gave very clear instruction on how to correct him without him getting the wrong message. Following correcting Ted 2-3 times as Sam had explained he worked very well, listening to each turn very sharply! After a short break we did some retrieves and it was reassuring to hear that Ted is very good at marking and a great delivery When you don't have much experience it's genuinely hard to know whether something is right or your doing it wrong and you just don't know any better. This is something I found before with getting Ted to look at me before retrieving, which can make him lose the mark. Previously I didn't know any better but thankfully I have sorted this previously. I came away from the experience feeling very good about progress so far. Sometimes it's just nice to know things are on track. I did query with Sam about a puppy test in the coming summer, Sam was very reassuring and thought Ted could do very well, she said he could probably win a novice test with how hes doing at the moment which was very nice to hear, although she said just take it easy with him, as too much pressure on young dogs can cause them to go unruly and not listen at all, or dry up and become really sticky. I found this advice really helpful, and also got some ideas of how to let Ted just have play time, and the do's and don'ts of letting him just have down time. I always find it unhelpful when someone says "let him be a pup" as that's just so vague, being able to talk things through with someone and get some good do's and don'ts was helpful for me that's for sure. Well done Ted and yourself I was told many year's ago its more about training the trainer, keep us updated with Ted's progress. Got my lad to concentrate on the bird now rather than making eye contact - took a couple of days but he watches the bird 100% now - his marking is near perfect so you were right Lloyd about where he should be looking. Pleased you have found a sensible lady trainer and the lad is doing well. I miss having a dog about the place and mine have always been family and not shut out in a kennel when not required. My very best dog ever wa a choccie lab called Muffin. I went on holiday when he was about 6 months old but had friends across the road who had a young spaniel about the same age and they said they would look after Muff whilst we were away. They had a friend who was a 'trialler' and she looked at my dog and said he would never make it, his legs were all wrong for jumping things etc etc., in fact old Muff was just overjoyed to clear a five bar gate, particularly if he could do it right under the nose of someone astride the gate also climbing over. I'm sure he waited for the chance. He would sit at heal and mark birds when I picked up, he would work a ditch and hedge bottom if I asked and would blood trail a deer and try to retrieve it once he found it. He found a roe buck for me 24hrs after the stalkers dog had failed the day before, buried under the grass in the bottom of a drainage ditch. He was the only dog I have seen who would actually dive after a duck and bring it back up and would hang in the flow of the River Usk watching for ducks coming down stream. All this and more and a lady Expert Trialler had said he was useless. Look after that little dog, I think he is going to be a cracker. In a trial it could be the difference between the dog going straight out and a delivery straight back to hand, and a dog running to the wrong spot and faffing about in the wrong place for a while. Well since my last lesson with Sam I haven't done a lot with Ted. It's been absolutely mental in work at the hospital supporting with discharges so the last week has seen limited times out, apart from short walks I think we only went out once in the last week for a good run on the local park which had some flood lights up for the rugby. 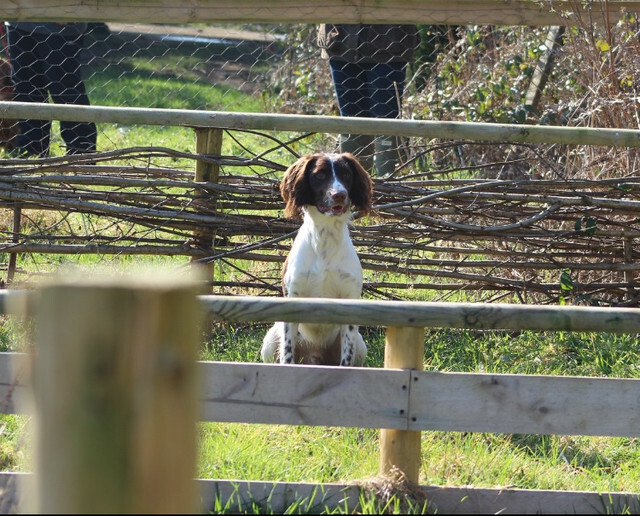 This was an eye opener for me, as Purdy was a game keepers dog who had taken the dog out lots when young, near pends etc, the dog was steady but had almost no go in it at all. Sam explained that this is why we take it nice and slow with young dogs. Regardless Purdy was handy as she was nice and calm and we got to practice Ted sitting up whilst another dog gets to go out and have a retrieve in front of him. Ted sat lovely and no noise, lots of encouragement and he did well. 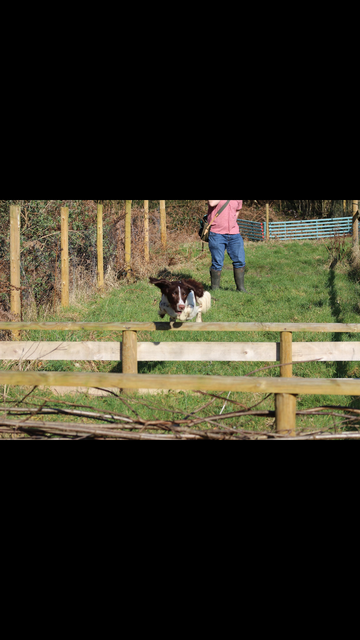 We did some further work with him doing marked retrieves and building confidence going back distance. Sam also showed me what to do to get a dog to hold the ground when you know there is a dummy there. Previously when Ted is the wrong side of wind, if he can't find the dummy after a while he can go off in the wrong direction. Sam showed me how to work with Ted to stop him ********* off hunting and try to get him to hold the ground. We also did a short spell of hunting in some thicker cover than last time, which Ted was quite slow with. Previously on grass he was flying about and I had been wondering about this, Sam was reassuring that he is only 9 months and that's just his confidence, as he builds confidence and experience he will improve so that's all good! Plan moving forward is just get Ted out in more areas of cover and let him just have fun, building up his confidence in different types of cover, work on the retrieve particularly holding an area was also glad Ted was steady with another dog retrieving in-front of him as he will need to be if he is to run in a test this summer. It's massively helpful just knowing from someone with experience that even the things that go slightly wrong are really common, explaining why the dog is doing it and how to put it right You don't get the same input from a book or dvd! Arriving in Wales a bloke who trains in the group was letting everyone use his land, fair play it was a brilliant setup. As I only have a car a lad let me throw Ted in with his dogs in the transit K9 box and I hopped in for a lift across the fields. We got to the training spot and they have a big release pen with cover in (approx 50m x 50m) and I could see in the corner had 2 pheasants running about. They were running like a mock test and asked if I wanted to go first with the bloke who was running it on the other side. First up off we went, I chose the side furthest away from the pheasants as the other blokes dog was much older, approx 3 I think, I thought Ted might see the birds and try to go after but thought it’ll happen sooner or later and what better situation for it as I can get to him quick. Anyways, off he goes on command, working out each side about 10 feet, he turned on every whistle and stayed nice and close. BANG - off goes a shot and down he sits . Bloke in the middle throws a dummy out and both dogs remain stead, they tell me to send Ted and he’s straight out to the spot and brings I back delivered to hand! . Next we hunt forward a few steps and again bang, he drops to shot but this time it’s the other dogs turn. Luckily Ted was on my left and I was between him and the other dog / dummy as I could see him twitching eager to go but luckily he stayed put. We hunted in a step or two then we were told that a dummy had been placed where we started. A shot was fired and I gave Ted the get back command, he went back lovely but was wrong side of the wing and pulled out the area a bit, luckily I stopped him and got him back and he picked the dummy and back to hand. Lead on job done! I wasnt sure how we did as we had gone first. Well after a while stood at the side lines I was very happy with his performance, most of the dogs were between 2-4 years and there was a mixed performance, lots pulling way outside of the pattern area, crossing into the other dogs beat, a few not stopping or running in. 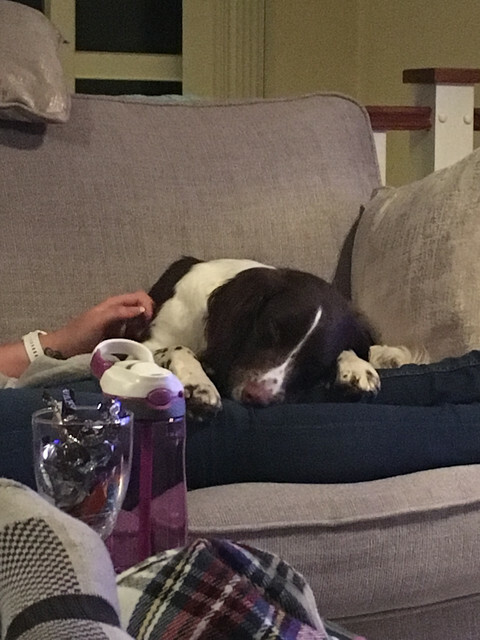 We finished the day off calling in at my parents where he had some play outside with the old lab and spaniel that live with my parents, before heading home to Bristol where he soon curled up on my GFs lap and fell asleep!! He knows where his bread is buttered! I would see if you can get Ted a contact flush if you have any ground with just the odd pheasant on it. Just the odd one now and then, too many to soon and you may get over confident I would love to see the little fella working. Forgot to mention - the ground was very good in that it had a retrieve lane with a long lane, and then a jump, then a patch of cover, then another jump, with some more cover. Basically two jumps - I started off with a seen retrieve over 1 jump - shouting at Ted “Get over” which we have done the odd time with a small fence near us. Straight over he went and back with the dummy to hand - after two goes on this we tried over both fences - I blew the stop and told him get over - Over the fence he went - dropped to the whistle again and told to get over and over he went gave him the hunt command and he soon found the dummy and was on his way back!! Been looking for a safe fence like this for a while so was good to finally have a go at it! How’s the pup coming along mate? looking forward to this summer though doing some game training. He's coming on great guns, we take him out on a 100 acer site opposite us which has a mixture of hedges, ditches, woods and open fields that has rabbit sets, badger sets, fox holes pigeons squirrels and the odd muntjac so plenty to get the scent going we have him on a 20mtr training line at present but he is unaware that we do not hold it and he's happy to run side to side of us as we walk never to far away he's also out with other dogs so gets to play like a puppy should but every now and then when he is hard on a scent we recall him with the whistle which he responds to like a rocket as we treat him (rightly or wrongly depending who you talk to) on his return he's bit of a puller if we walk him on a normal lead but I'm a tad reluctant to hold him back just yet as would not want to hinder his desire to hunt. Part 9: Out with the old guards - cover bashing. Ted turned 10 months this week gone and over the weekend I went back home to my parents to check out a clay ground near them with my BIL who I recently got into shooting. After the clays (terrible, my BIL best me!) I spent the next day taking Ted down Kenfig nature reserve with my old spaniel Jess. Jess is either 8 or 9 now I lose track, she was my first springer, she could hunt well but the combination of my inexperience and my mum and dads love of walking her and the lab and saying how much they enjoyed running off chasing things soon led to her being a pet 🙄. Anyways, the girl can hunt! So I took her with Ted on some ferns and light cover, as he is good on log grass but lacking confidence in thicker stuff. This morning the day after I took Ted on a walk and let him run in on a few balls throws, then threw the ball into bramble / long grass mix. Straight in he went like a steam train. Pushed through the cover and got the ball we had 4-5 more spread out and lots of praise and he was wagging his tail and going in on command so seemed happy. Will keep building his confidence and hopefully be a good cover basher for next season. Just checking in mostly, not a lot to report back recently, just mostly waiting for Ted to be a bit older before we start back on more stuff. We are spending time just going out, and I am letting Ted hunt around on his own a bit more so he doesn't look at me too much. I scouted out a bit of woodland 5 mins from home which seems to have a bit of scent in and he hunted well recently. Recent acquisitions involve a dummy launcher off here for a few quid, so that'll be fun to use over summer, and I also today went to see a new shoot that's 15 minutes from home, which I am joining as a gun for next season. Not sure what to do at the moment, I am trying to just take Ted on walks and see if we can find some land with rabbits to see how he would react to a flush on them for the first time, sadly however, at the moment they are thin on the ground. Is Ted stopping to look at you or just a quick glance, I prefer my dog just to keep having a quick look to see were I am, it doesn't slow him down or alter his drive, I also use every opportunity that arises to make him stop to flush again that doesn't slow down his drive to hunt. Have you tried the dummy launcher yet keep a good hold of it and keep it clean and lubricated. Quick glance when out on new ground so not worried about that, just on ground with nothing about he will stop and stare at me... as we get onto game more and the penny drops he SHOULD do this a bit less. I took Ted to a bit of woodland that I found recently just up the road from home, its got great cover, nothing harsh but lots of tall grass, fallen trees etc, really nice spaniel ground. I set him off and he was brilliant, I've never seen him like it before, back and forth, running into the grass pushing through clumps and covering ground well. I was amazed. After 3-4 turns he ignored the turn whistle, then BOOM, he just took off 😯 Normally a shout of AAHHHH NOOO and he stops, but none, he was gone. I took off after him straight away, but he was gone. I was very worried immediately, as it was about 30 mins before dark and he was lost in the woods. Luckily I heard a noise and up ahead saw a flash. I got out still after him and after about 2 mins (felt like an eternity) I got out to him and got hold of him. Straight out after him I was, taken by the scruff and marched back to the spot he had ran off from. Called it a day after that, lead back on and walked back home. As always, ups and downs. Upside, I've never seen him hunt so well. He was really looking for something, obviously must have been something about (I couldn't see him chase anything or even hear anything running off), the downside, he obviously can't go charging off on his own whenever he wants. Had a reassuring phone call and chat with his breeder, he had a good laugh and said it happens, and gave me some good advice. He said also very reassuring that Ted's confidence wasn't knocked after being told off. Good signs. I remember another field trial bloke once telling me, you don't know what a dogs personality is like, until you give it it's first proper telling off and see how they handle it. Advised to be strict on him now moving forward, coming up 11 months in a week or so, the last 2 weeks+ I have really noticed his confidence improve when out, which is good. Lately before this happened I have been a bit torn about whether to let him be a bit more free, or to start being strict on steadiness. 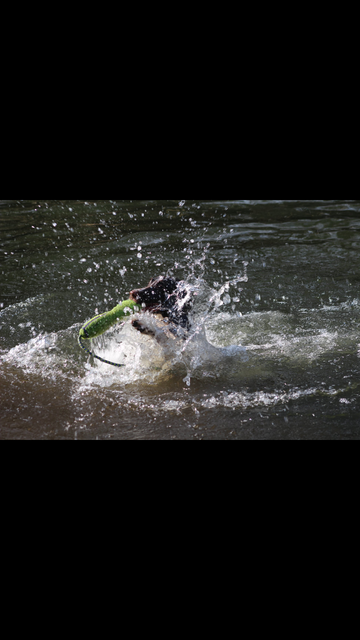 I know some people let dogs chase and build loads of drive, only to steady them up later, and others steady them solid and them get onto game, two totally different approaches. After tonight he will be going with the strict on steadiness option! Will go back and see Sam again for another lesson as well and get some good guidance moving forward. I hope this is at least a realistic reflection of how dog training can go. I spoke to a few of the lads tonight and they laughed and said they've had it loads of times so not to worry, but to limit hunting now and get it nipped in the bud before it becomes an issue.